Here on Earth, we tend to take our atmosphere for granted, and not without reason. Our atmosphere has a lovely mix of nitrogen and oxygen (78% and 21% respectively) with trace amounts of water vapor, carbon dioxide and other gaseous molecules. What’s more, we enjoy an atmospheric pressure of 101.325 kPa, which extends to an altitude of about 8.5 km. In short, our atmosphere is plentiful and life-sustaining. But what about the other planets of the Solar System? How do they stack up in terms of atmospheric composition and pressure? We know for a fact that they are not breathable by humans and cannot support life. But just what is the difference between these balls of rock and gas and our own? For starters, it should be noted that every planet in the Solar System has an atmosphere of one kind or another. And these range from incredibly thin and tenuous (such as Mercury’s “exosphere”) to the incredibly dense and powerful – which is the case for all of the gas giants. And depending on the composition of the planet, whether it is a terrestrial or a gas/ice giant, the gases that make up its atmosphere range from either the hydrogen and helium to more complex elements like oxygen, carbon dioxide, ammonia and methane. Mercury is too hot and too small to retain an atmosphere. However, it does have a tenuous and variable exosphere that is made up of hydrogen, helium, oxygen, sodium, calcium, potassium and water vapor, with a combined pressure level of about 10-14 bar (one-quadrillionth of Earth’s atmospheric pressure). It is believed this exosphere was formed from particles captured from the Sun, volcanic outgassing and debris kicked into orbit by micrometeorite impacts. Because it lacks a viable atmosphere, Mercury has no way to retain the heat from the Sun. As a result of this and its high eccentricity, the planet experiences considerable variations in temperature. Whereas the side that faces the Sun can reach temperatures of up to 700 K (427° C), while the side in shadow dips down to 100 K (-173° C). Earth’s atmosphere, which is composed of nitrogen, oxygen, water vapor, carbon dioxide and other trace gases, also consists of five layers. These consists of the Troposphere, the Stratosphere, the Mesosphere, the Thermosphere, and the Exosphere. As a rule, air pressure and density decrease the higher one goes into the atmosphere and the farther one is from the surface. Closest to the Earth is the Troposphere, which extends from the 0 to between 12 km and 17 km (0 to 7 and 10.56 mi) above the surface. This layer contains roughly 80% of the mass of Earth’s atmosphere, and nearly all atmospheric water vapor or moisture is found in here as well. As a result, it is the layer where most of Earth’s weather takes place. The Stratosphere extends from the Troposphere to an altitude of 50 km (31 mi). 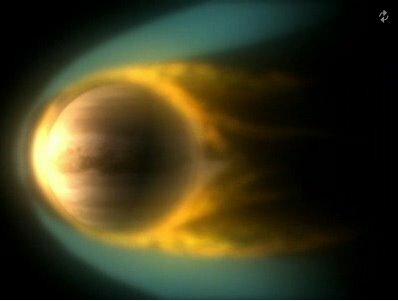 This layer extends from the top of the troposphere to the stratopause, which is at an altitude of about 50 to 55 km (31 to 34 mi). This layer of the atmosphere is home to the ozone layer, which is the part of Earth’s atmosphere that contains relatively high concentrations of ozone gas. Next is the Mesosphere, which extends from a distance of 50 to 80 km (31 to 50 mi) above sea level. It is the coldest place on Earth and has an average temperature of around -85 °C (-120 °F; 190 K). The Thermosphere, the second highest layer of the atmosphere, extends from an altitude of about 80 km (50 mi) up to the thermopause, which is at an altitude of 500–1000 km (310–620 mi). The lower part of the thermosphere, from 80 to 550 kilometers (50 to 342 mi), contains the ionosphere – which is so named because it is here in the atmosphere that particles are ionized by solar radiation. This layer is completely cloudless and free of water vapor. It is also at this altitude that the phenomena known as Aurora Borealis and Aurara Australis are known to take place. The exosphere is located too far above Earth for any meteorological phenomena to be possible. However, the Aurora Borealis and Aurora Australis sometimes occur in the lower part of the exosphere, where they overlap into the thermosphere. The average surface temperature on Earth is approximately 14°C; but as already noted, this varies. For instance, the hottest temperature ever recorded on Earth was 70.7°C (159°F), which was taken in the Lut Desert of Iran. Meanwhile, the coldest temperature ever recorded on Earth was measured at the Soviet Vostok Station on the Antarctic Plateau, reaching an historic low of -89.2°C (-129°F). Planet Mars has a very thin atmosphere which is composed of 96% carbon dioxide, 1.93% argon and 1.89% nitrogen along with traces of oxygen and water. The atmosphere is quite dusty, containing particulates that measure 1.5 micrometers in diameter, which is what gives the Martian sky a tawny color when seen from the surface. Mars’ atmospheric pressure ranges from 0.4 – 0.87 kPa, which is equivalent to about 1% of Earth’s at sea level. Because of its thin atmosphere, and its greater distance from the Sun, the surface temperature of Mars is much colder than what we experience here on Earth. The planet’s average temperature is -46 °C (51 °F), with a low of -143 °C (-225.4 °F) during the winter at the poles, and a high of 35 °C (95 °F) during summer and midday at the equator. The planet also experiences dust storms, which can turn into what resembles small tornadoes. Larger dust storms occur when the dust is blown into the atmosphere and heats up from the Sun. The warmer dust filled air rises and the winds get stronger, creating storms that can measure up to thousands of kilometers in width and last for months at a time. When they get this large, they can actually block most of the surface from view. 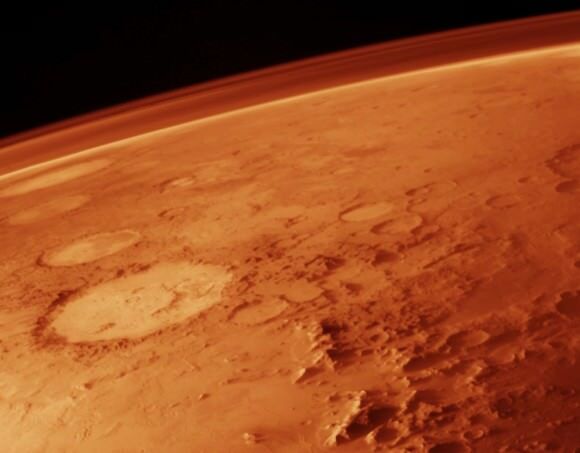 Trace amounts of methane have also been detected in the Martian atmosphere, with an estimated concentration of about 30 parts per billion (ppb). It occurs in extended plumes, and the profiles imply that the methane was released from specific regions – the first of which is located between Isidis and Utopia Planitia (30°N 260°W) and the second in Arabia Terra (0°N 310°W). Ammonia was also tentatively detected on Mars by the Mars Express satellite, but with a relatively short lifetime. It is not clear what produced it, but volcanic activity has been suggested as a possible source. The outermost layer, the thermosphere and corona, extend from 4,000 km to as high as 50,000 km from the surface. This region has a uniform temperature of 800-850 (577 °C/1,070 °F), although scientists are unsure as to the reason. 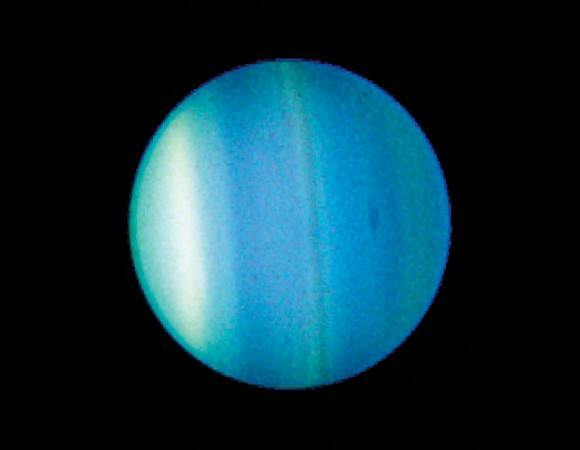 Because the distance to Uranus from the Sun is so great, the amount of sunlight absorbed cannot be the primary cause. 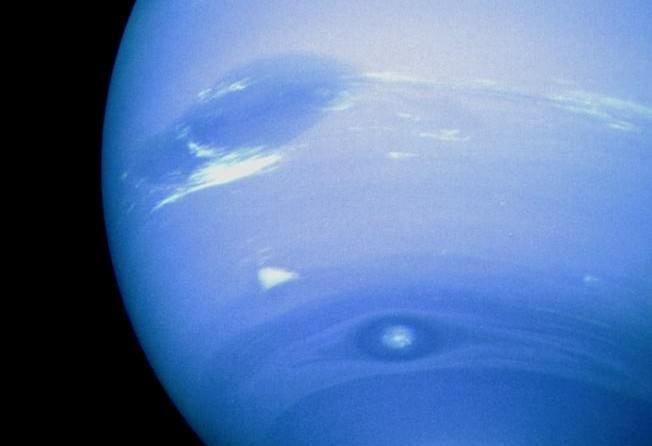 At high altitudes, Neptune’s atmosphere is 80% hydrogen and 19% helium, with a trace amount of methane. As with Uranus, this absorption of red light by the atmospheric methane is part of what gives Neptune its blue hue, although Neptune’s is darker and more vivid. Because Neptune’s atmospheric methane content is similar to that of Uranus, some unknown constituent is thought to contribute to Neptune’s more intense coloring. The Scooter is another storm, a white cloud group located farther south than the Great Dark Spot – a nickname that first arose during the months leading up to the Voyager 2 encounter in 1989. The Small Dark Spot, a southern cyclonic storm, was the second-most-intense storm observed during the 1989 encounter. It was initially completely dark; but as Voyager 2 approached the planet, a bright core developed and could be seen in most of the highest-resolution images. In sum, the planet’s of our Solar System all have atmospheres of sorts. And compared to Earth’s relatively balmy and thick atmosphere, they run the gamut between very very thin to very very dense. They also range in temperatures from the extremely hot (like on Venus) to the extreme freezing cold. And when it comes to weather systems, things can equally extreme, with planet’s boasting either weather at all, or intense cyclonic and dust storms that put storms here n Earth to shame. And whereas some are entirely hostile to life as we know it, others we might be able to work with. For more information on atmospheres, check out NASA’s pages on Earth’s Atmospheric Layers, The Carbon Cycle, and how Earth’s atmosphere differs from space. Astronomy Cast has an episode on the source of the atmosphere. The article of Uranus lost the last part of the text. Very well written piece. A few minor issues though. It looks like the last bit has not been properly edited. Apostrophe has been used quite liberally where it’s not needed. Grammar also needs some edits, here and there. Overall a very good read. However, I was somewhat disappointed that Pluto has been left out. After the New Horizons fly by, I’d have thought that there was enough material to include Pluto as well. Hopefully, the article will be edited to include the last planet.